The Sunshine State’s many exceptional natural features have made it a tourism mecca and standout in the oeuvre of postcards, but promoters may want to bury the latest description of its coral reefs. The most comprehensive report on the state of Caribbean coral reefs calls Florida’s reefs “a special case”– and not in the good way. “Florida has seen a sharp decline in its coral reef in the past 40 years,” says Carl Gustaf Lundin, Director of Global Marine and Polar Programme at the IUCN, the world’s authority on extinction and publisher of the report on Caribbean reefs. “Improved management, particularly of reef fish and regulation of coastal use can help reverse this trend,” he says. Decadal decline applies to most Caribbean reefs, but the report singles out the Florida Reef for its harshest assessment. Florida represents the “worst-case scenario” where “intensity of human use and environmental impacts greatly exceeds that of any other region in the wider Caribbean, if not the world,” states the IUCN report, Status and Trends of Caribbean Coral Reefs: 1970-2012. The report analyzed 35,000 reef surveys to detect patterns across the region. The report names Jamaica and the U.S. Virgin Islands, in addition to Florida, as places lacking healthy corals. One trend emphasized in the report is that positive human intervention can control negative impacts. “The Gulf of Mexico has some of the worst and some of the best reefs in the Caribbean. The key determining factor for this is the way the reefs have been managed,” says Lundin. Only in recent years have entire ecosystems been considered candidates for mass extinction. According to the IUCN, the wider Caribbean region of reefs qualifies as “endangered” under its new criteria for ecosystems. In 2006, two major Caribbean corals were listed as threatened under the U.S. Endangered Species Act. In 2009, Florida passed the Coral Reef Protection Act, and it establishes fines for boat strikes that damage coral. The threatened staghorn and elkhorn species are stony corals that have constructed much of the Florida Reef. The theory of reef extinction being played out in Florida and elsewhere is that if reef-building corals die out, the system dies with it. Coral reef ecosystems host the greatest concentration of species in the ocean. 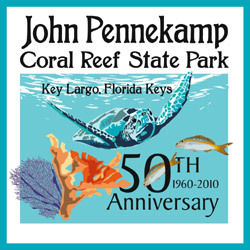 The Florida Reef contains 455 square miles of reef area and stretches across the Florida Keys, Miami, and north of Palm Beach into Martin County. This northern section along the mainland lies outside the protection of the Florida Keys National Marine Sanctuary, established in 1990. Unlike the Everglades, its sister ecosystem on land, the system of reefs that dot the southeastern Florida coastline does not have an iconic name. Scientists call it a “tract,” but I prefer to drop that ugly term and dub it the “Florida Reef.” Even better would be the term “Great Florida Reef,” but its recent history and status are anything but great. A timeline for the Florida Reef within the IUCN report demonstrates that the number of new protective measures has waned since the end of the twentieth century. Note that a no-take area, banning all fishing and related activities, first appeared in 2001. These no-take areas comprise six percent of the reef area in the Florida Keys. The list below revises the report’s original timeline by removing natural disasters and including only protective measures.